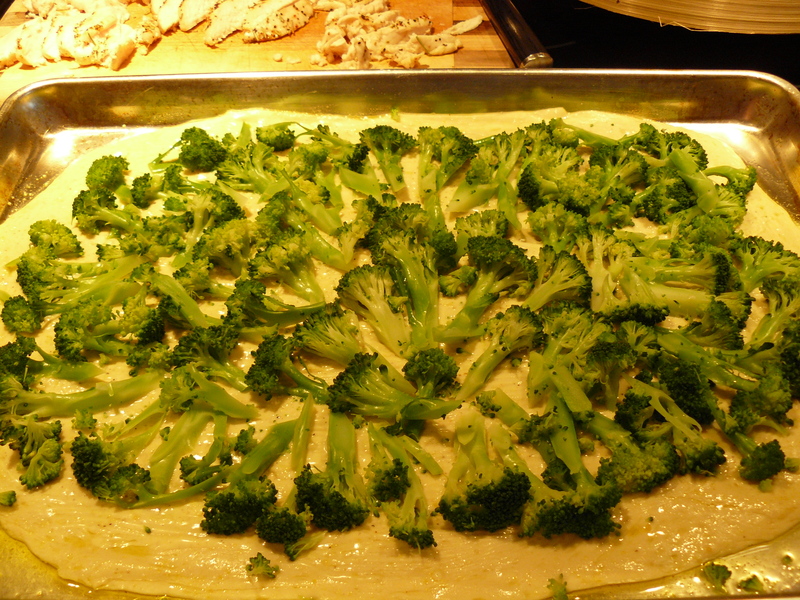 Have you ever had the Silano pizza at Bertucci’s–the one with broccoli and chicken in a lemon cream sauce? I haven’t had it in years, but always loved it. Now that I feel comfortable making traditional pizza and scacciata, I wanted to try something different and springy. It’s really not difficult, it just takes a few steps–and you can spread them out throughout a Sunday to make it seem even easier. Here’s a link to the dough. I recommend making it a day or two before and letting it do its thing in the fridge. Let’s start with the lemon cream sauce on your actual pizza-making day. Make ahead earlier on and refrigerate it till it’s time to use if you like. Melt butter in a skillet over medium heat. As the butter melts, add the grated lemon zest; stir it around about a minute as it sizzles. Pour in the lemon juice/white wine, add salt, stir and bring the liquids to a simmer. Cover the skillet, and let simmer just a couple of minutes. Cut the pieces as evenly as possible, cook at 450 degrees F for 15 minutes. 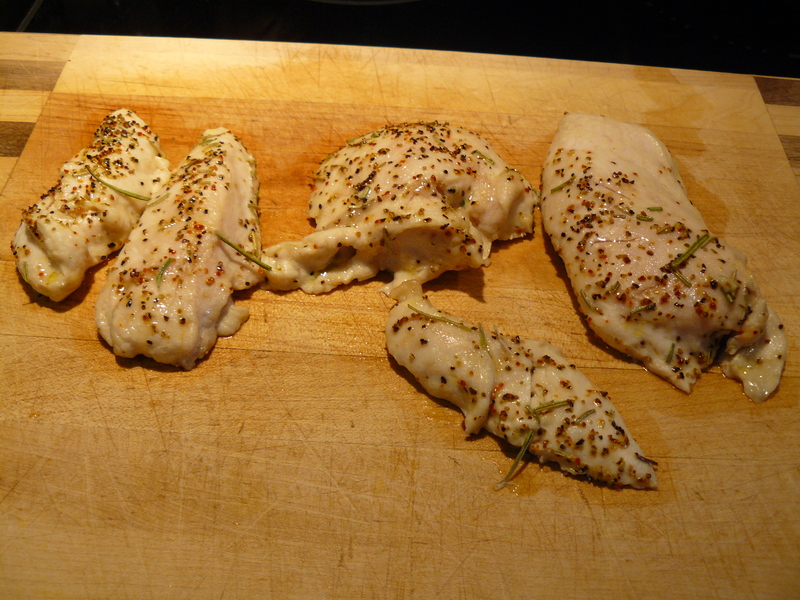 This should leave some of the chicken a bit pink so it’ll finish cooking on top of the pizza instead of drying out. Slice the chicken to top the pizza. Generously oil a sheet pan. Press/shape pizza dough into a pan forming a large rectangle or oval–whatever shape begins to form as you even out the dough. Mine is a little of each, HA HA! 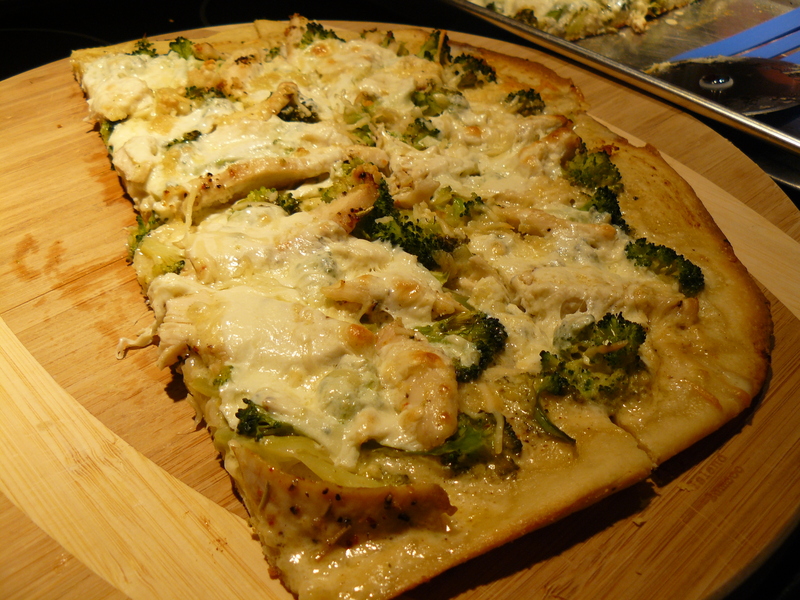 Brush lemon sauce over crust. 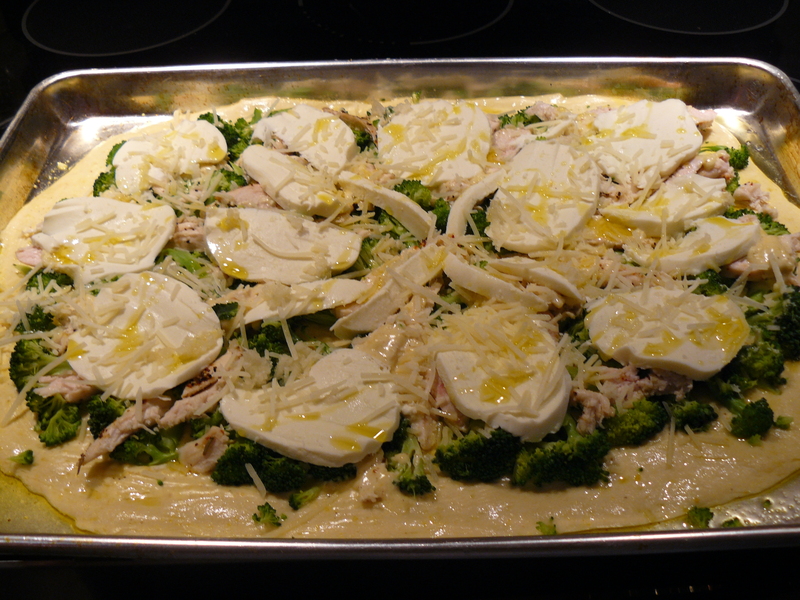 Brush remaining lemon sauce over top, then add fresh mozz, pecorino and garlic. Drizzle with olive oil. I baked for just 15 minutes on top of my pizza stone (permanently residing at the bottom of my oven) at 450 degrees F. Take a look at the 15-minute mark to see if yours is ready, too. If not, you may need anywhere up to 5 more minutes–just depends how thin you’re able to press out the dough. I let mine come to room temperature about 30 minutes before I got started, and I think that helped. Et voilà! Springtime is served. Care for a slice? Wow! It’s the middle of the night; I can’t sleep. I’m hungry and I wish I had a big slice of this right now! 😀 Thank you! Wish I could bring you a slice!